Gorgeous large mauve / smokey purple bead (synthetic) with gorgeous random dark and caramel coloured markings. 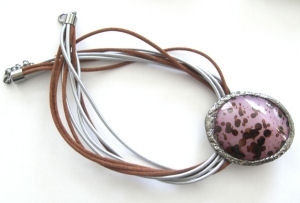 the bead is surrounded by a patterend ring of silver tone metal and the whole is strung together with 4 strands of dark brown cord and 4 strands of silver coloured cord. Necklace is finished with a silver tone clasp.